I have five cleaning products that I use which are all made from natural ingredients. Mix 1/4 cup of vinegar to 32 oz of water - Recycle a used spray bottle. Instead of using paper towels use old t-shirts to clean with. These are great recipes.I love a clean cleaning recipe. I'n making the window cleaner right now! I love using natural products I have around ht house! I can't wait to make these! I've never been comfortable using commercial cleaners. They are SO toxic! This is simply the easiest thing to do in your house bc most of us have all these ingredients. I love them. So clean and green! Thanks! I've been thinking about doing this for awhile and I love these recipes. Nothing smells as good as a home cleaned with citrus! We stopped using other cleaners years ago, and now they smell terrible to me! These are great to have on hand especially when we run out of supplies. Great solutions to keep natural cleaning products. These are awesome, thanks. I'd much rather use natural products than ones that are filled with chemicals. I've used vinegar as a cleaning agent many times! It works really nicely! Vinegar and baking soda are great. They can clean just about anything. I pinned this, with 5 kids I like using more natural products to keep the home safe and healthy. This is a great list. 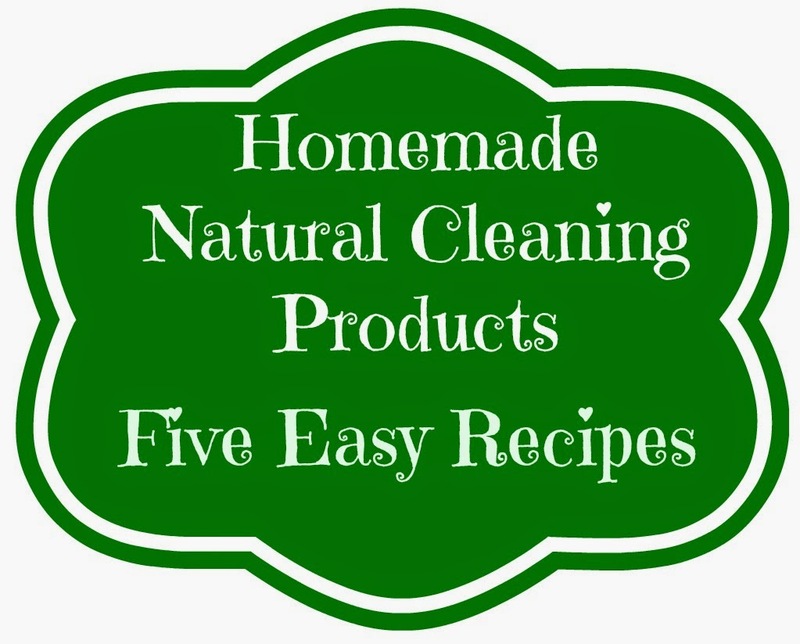 I love the idea of using all natural cleaning products. Wow perfect! I hate using chemicals and can't anymore due to having a parrot so this is wonderful! I would really like to focus on using more natural cleaning products and love the idea of making my own. Thanks so much for sharing these recipes! I love making home made cleaning products. They are also much safer when cleaning around kids. Lemon juice is always a go too when making cleaning products! Thanks for the recipes! I'll have to try out that counter top cleaner recipe. The current cleaner we have seems to bother asthma! I need to pick up some Borax. I make a lot of my own cleaners. It saves money and I dont get sick. I love this. We are trying to minimize the number of chemicals we use to clean our home. I will definitely pin this. Thanks for the recipes! We do a lot of homemade cleaners here too. My dogs are very allergic to the chemicals a lot of cleaning products have in the ingredients, so all natural is the way to go here! I love when natural ingredients work for what you want them too. I especially love it when they work for cleaning! I've just recently discovered the wonder of white vinegar. I'm so impressed with all it can do! Oh thanks so much for sharing these. I've been wanting to try some natural cleaning tools that I could make at home. Incredible natural cleaning recipes! I hope that it doesn't matter exactly what kind of essential oil you put into these cleaners. My favorite is the lavender essential oil and I want to put a few drops of it. Regards! Chelsea Carpet Cleaners Ltd.
We use a lot of these same natural cleaners as well. It is a great savings as well as makes you feel better about cleaning. Thanks for sharing, I have been wanting to make my own cleaning products! Thanks for sharing. I love making my own natural items. Recently made a Natural Spider Spray! While I love natural cleans, I'm not a fan of using vinegar. It can be harsh on your surfaces and it leaves a smell behind which I'm not a fan of. This is exactly what I have been looking for... I need to use natural products more often. I haven't started spring cleaning yet. Thanks for the great cleaning recipes to help me. I have really got to start using less toxic chemicals. i clean so much that I think we are becoming much more susceptible to colds. I'm totally trying the lemon juice and olive oil on my wood. I love the smell of lemons and even have an indoor lemon tree! Thank you for these great recipes. I am going to try some of these natural cleaners in my house. Thanks for the recipes! I'll have to try these for Spring Cleaning! Thanks for sharing all of these great recipes! We are making the effort to use natural cleaners now. They are so much healthier and usually work better too (and save money). I will definitely try these recipes for my house. I have been trying to limit our exposure of chemicals any way i can. I've used vinegar in many cleaning recipes. Thanks for all the natural recipes better than harsh chemicals. Thanks for sharing your recipes. I've pinned your post to reference again later! These are great tips. I use vinegar and baking soda to clean everything. These are some great recipes for spring cleaning! I didn't know about a few of these. Thanks for sharing. These are so simple and I Can totally replicate these! I love using vinegar to clean! This is a great idea. I will have to try this! I should do this more often. It seems safer and more cost effective. Thanks for the recipes! This is perfect timing. I feel like vinegar and baking soda are the ultimate in cleaning power - they handle almost everything!! Well, this is good combination of home recipes to keep our carpet clean and attractive. Most of the ingredients which you have mentioned are easily available so it makes our job easier. Just what I needed - DIY cleaners when I'm on a budget. Thanks for sharing the post you're literally my savior!